The reigning Verizon IndyCar Series champion and points leader placed third in 2016. Other finishes haven’t been reflective of his performance, but Newgarden is fast, aggressive and smarter by the year. Roger Penske and his team live to win Indy, as evidenced by a record 16 titles. Age: 43. Hometown: Sao Paulo. The only three-time winner in the field looks to join A.J. Foyt, Al Unser Sr. and mentor Rick Mears atop the all-time list. With three runner-up finishes, Castroneves is less than six-tenths of a second short of being a six-time winner. Although a sports car racer full time now, he understands Indy implicitly. And he has Roger Penske himself calling his strategy. Age: 26. Hometown: Nevada City, Calif.
A punctured tire slowed him in qualifying, but Rossi should be plenty fast in the race and his climb through the field ought to be impressive. 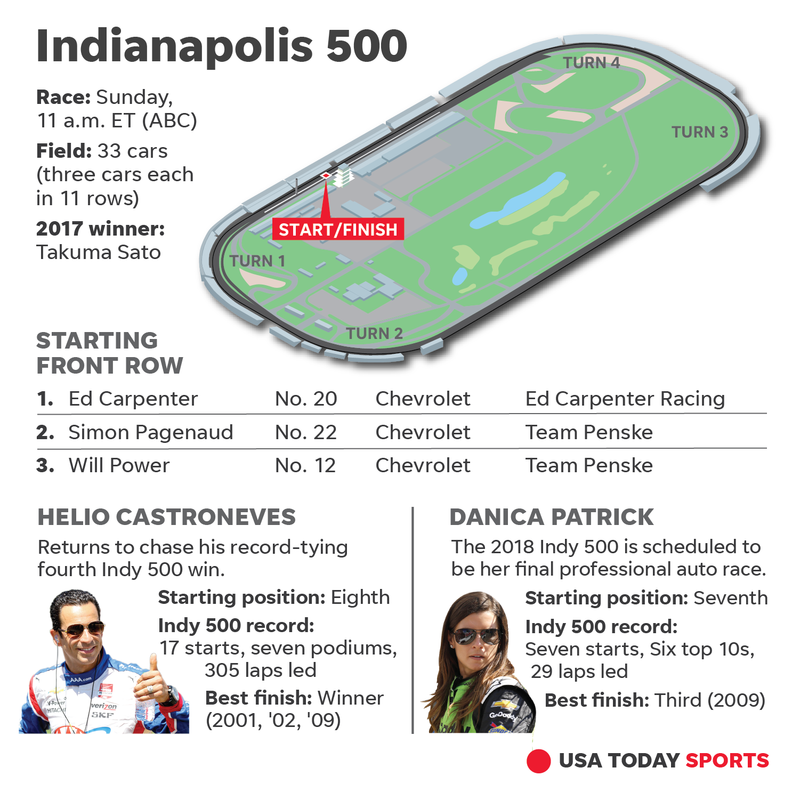 Rossi won the 100th Indy 500 in 2016 by stretching his fuel longer than any rookie should have been able, and he has become a more polished IndyCar driver with two more victories since. The 2014 series champion and 2015 Indy runner-up might be the best driver in the field not to have won the 500. Some people take time. (See: Tony Kanaan.) Some never do win it. (See: Michael Andretti.) But Power has all the resources available to him for his 11th try, and that’s all any driver can ask. The four-time series champion won the 500 in 2008 and in 15 tries has finished fifth or better four five other times. Race conditions should mitigate the speed differential between manufacturers that was seen in qualifying. If Dixon has the car, he’ll be in front; if he does not, he’ll make the most of what he has. After missing last year’s 500 with pelvic fractures suffered in a qualifying crash, he was back in the car for the final three races of 2017. Then Bourdais won this season’s opener in St. Petersburg, Fla. Now he’s the fastest Honda qualifier. Coyne, although not one of the series’ traditional powers, is a winning team that finished third last May with rookie Ed Jones driving a damaged car. The oval specialist is as quintessentially Indy as they come, a former USAC driver, a Butler University graduate and stepson of Indy Racing League founder Tony George. In 14 starts, Carpenter’s best finish is fifth. That might not place him among the betting favorites, but it’s important for the three-time pole-sitter that he put together an entire race that reflects his speed.